Have you checked out Today's Daily Deal! 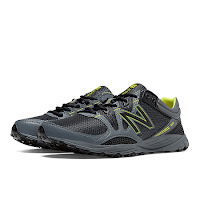 Save 56% on the Men's Trail-Running 101 Now Only $39.99 + $1 Shipping (discount applies automatically at checkout) at JoesNewBalanceOutlet.com! Offer valid Monday, 5/30. For the serious trail runner, the more challenging the terrain, the better. Now there's a shoe tough enough to keep up. The New Balance 101 trail running shoe for men is low-profile, ultra-lightweight and made for the trail. With ROCK STOP for added forefoot protection, no-sew mesh overlays, interlocking Sure-Laces to help keep out debris and an ACTEVA LITE midsole for premium comfort, it's ready for your longest-mileage trail runs.